During the 2018 season, the Kansas City Chiefs had the most explosive offense in the NFL. They led the league in points per game, points per play, yards per play, and yards per pass attempt. 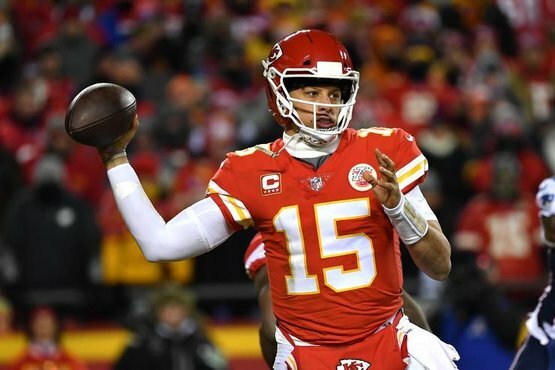 Their quarterback Patrick Mahomes threw 50 touchdown passes, which ranks 2nd all-time in touchdown passes in a single season behind Peyton Manning’s 55 during in 2013. Today, we look at three concepts that helped the Chiefs be so explosive in the passing game. 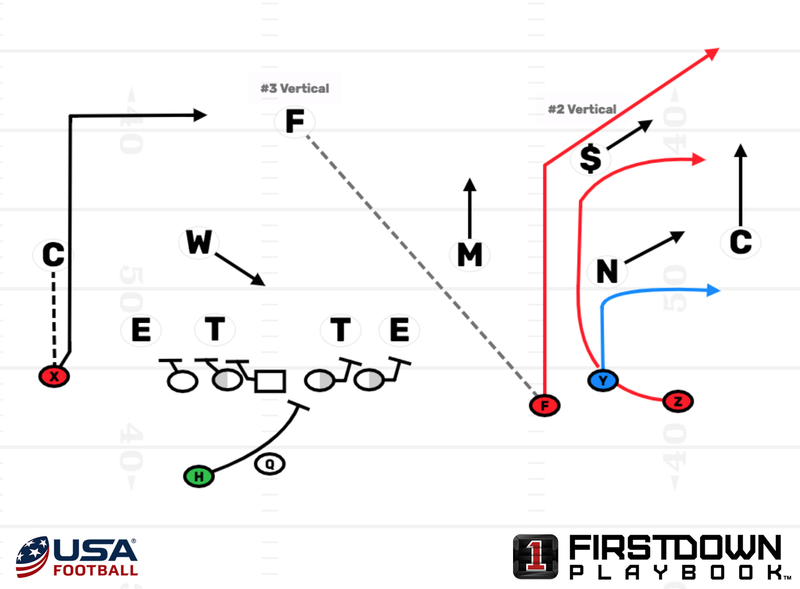 The post clears out the cover 3 cornerback covering the deep third and the nickelback gets nosey on the flat route. Although the nickel is the curl/flat player, he must run with the wheel because it is the first route into his zone. The coverage bust by the nickel allows Mahomes to hit the wheel for a 23-yard gain. Once Mahomes gets to the top of his drop, he sees the B-gap open up because the rusher over the right guard stunted inside to the A-gap. He scrambles out to his right. He sees that the corner stayed with the out route by the #1 receiver, which means he has the #3 receiver, Tyreek Hill, 1-on-1 with the strong safety. Hill runs a fantastic route, accelerating upfield to threaten the strong safety vertically, then taking one step inside to turn the safety around before cutting toward the sideline on the corner route. This creates over 5 yards of separation. Mahomes delivers a catchable ball on the run for a 34-yard gain. Protection-wise, the left side of the offensive line and center slide left while the right guard and right tackle man up the defensive tackle and defensive end. The Z-receiver motions behind the quarterback and fakes as if he were getting the hand-off on an end around before continuing on a flare route. The #1 receiver to the left runs a go route, the #2 receiver runs a deep crossing route, and the running back, who aligns behind the left tackle runs up the seam. The tight end on the right side of the formation runs a corner route. The quarterback fakes the hand-off and then goes through his reads. Against man, he picks his best match-up. Against single-high zone, he reads the inside routes before working outside. 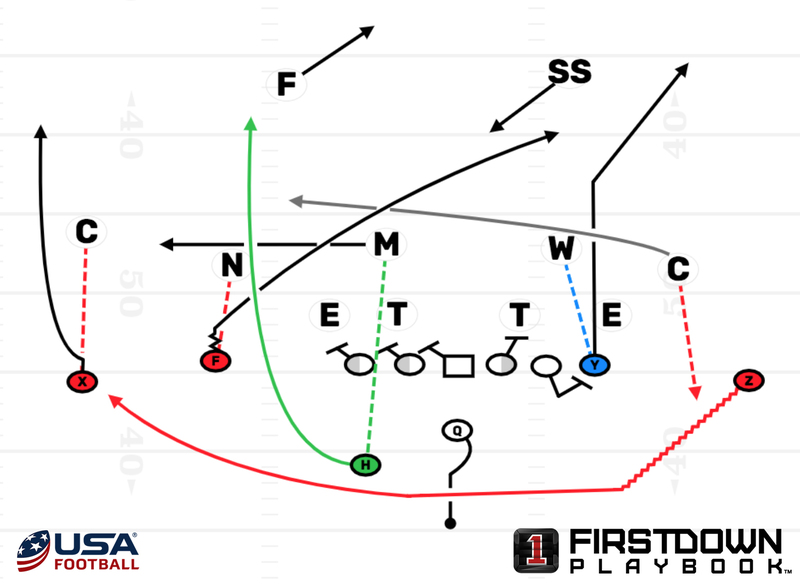 Against two-high zone, he looks outside before working the middle of the field. The flare is his check down. The Bengals rotate from 2-high to 1-high and play Cover 1 with the backside safety robbing the middle of the field. The mike linebacker does not keep his eyes on his man, the running back, and he goes to cover Tyreek Hill on the flare. He may have even tried to pass off the seam to the cornerback who is running with Hill but we cannot tell for sure. Regardless, nobody covers the back and Mahomes finds him for a 22-yard gain. 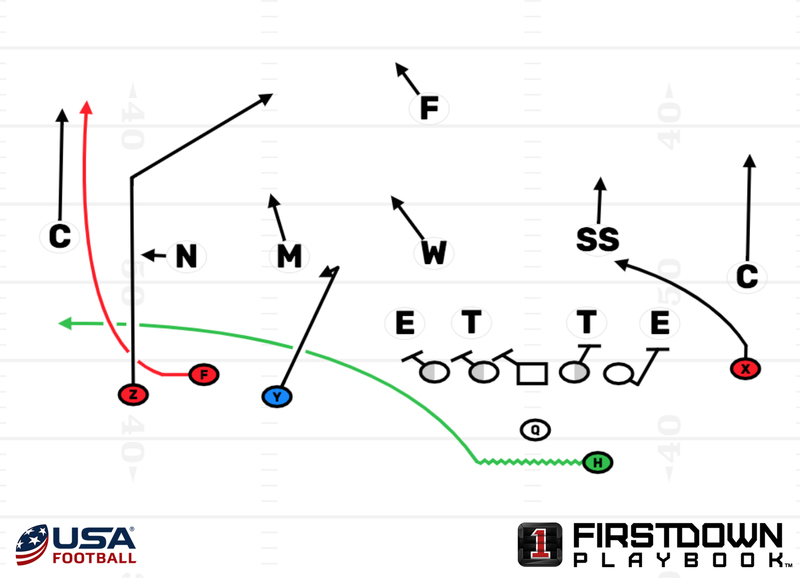 Overall, these three concepts can help any offense become more explosive in the pass game. They each threaten defenses vertically and horizontally. When installing pass concepts, always keep in mind the importance of attacking defenses at all levels of the field.